NEW management ... aka Mr. Owens has announced on July 15th that Dravin Frost will get his title rematch against new champion Giovanni the Greatest. Great opener as the crowd was pumped from the start. The fans began getting behind the newcomer and it showed. A lot of hatred was being thrown towards Starr probably due to the fact that he went way too far with the incident with Dravin Frost last month. In any event, Deakon seemed to not be bothered much by the reaction he was getting and within a few minutes put Mascara down with the infamous Villan Driver and the victory. This match had to be one of the best matches of the night. There was friction between the Puerto Rican Italian Connection from the get go. Joey seemed to have enough of Romeo and slapped him before storming off to the back leaving PRA to defend for themselves. Rome and Cumantude kept people entertained with some of their antics during the match which left their opponents and even the referee confused. The match continued on and was pretty even until friction arose again with the PRA when Romeo hit Eli inadvertently causing Rome and Cubantude to take advantage and hit the Hot Fresh Cuban from the top rope and getting an upset. This match saw the return to New Era Wrestling of Maxx Stardom and what a chance this was for him excepting the challenge of Giovanni and his number one contender contract. The fans were behind Stardom which aggravated both Giovanni and Owens. Giovanni took a couple breathers to the outside before getting his mind straight and back concentrating on the match. The match was a high pace with both men trying high risk maneuvers. It wasn’t until it escalated to the outside and a brawl that the competitors were counted out ending the match. This match was a draw, but still holder of the contract Giovanni the Greatest. After the match, as Hound Dog was celebrating, Bad Boy came back down to attack the number one contender. A few minutes of a brutal beating went by when all of a sudden none other than Dominic came out through the crowd against securities orders not to and speared Bad Boy. This gave Hound Dog the chance to get exit the ring and quickly after, none other than Kenneth Hughes came out to help Bad Boy to the locker room. These last two matches everyone was looking forward to as they had the most build up. The Puerto Rican Italian Connection came out and people could tell everything was still not right in the family as Romeo seemed to distance himself from the other two. Both Eli and Joey blew it off due to the importance of the match. The match was back and forth for a while until Joey got hit with a very hard hitting move that sent the Brooklyn Bully to the outside. PRA went over to check on Joey and Blanco was ready to jump on all three on the outside. Instead, Romeo got pushed into Blanco’s path and was the only one hit. When action continued in the ring, Romeo finally had enough and left ringside. Still in the madness that wan intensely argued and Romeo left, but not before throwing his shirt down. Even with the commotion outside, Joey still caught Blanco with Sleeping With the Fishes to pick up the win and become the Unified Florida State Champion. Coming into this match, no one thought Frost could be one hundred percent focused on the NEW Championship and that most of his concentration would be about getting his hands on Deakon Starr. In reality, it was the totally opposite and Dravin didn’t seem to be slowing down. He kept coming at the champion, which caught him off guard. Then out of nowhere, with everything Rayne threw at him, Dravin delivered a perfect looking Frost Bite that ended the match and The Morning Star’s reign as champion. The crowd went absolutely wild when they realized what had just happened. The roar of cheers from the fans was deafening. The winner and NEW New Era Wrestling Champion….Dravin Frost! While the new champion was celebrating, out came Deakon Starr, who tried hitting Frost with a steel chair but missed. The two went at it before Deakon got the better of Frost by hitting the Villain Driver. Concern looks appeared on the faces of fans and they weren’t sure what was happening. This led Jordan Owens to come out and demand Giovanni the Greatest to run out and cash in his contract which he did and the match was on. Everyone was in shock at this point and didn’t know what to think. Drain tried to fight Giovanni off as much as possible, but in a short span Giovanni hit the Greatest Elbow and within two minutes pinned Dravin. The winner and NEW New Era Champion…Giovanni the Greatest. Afterwards, all of Jordan’s men emptied the locker room to celebrate with the new champion. NEW:Our guest this week is Carrion, who will be a part of NEW Retaliation next week from the Riverside Community Center. NEW: How are you doing today and thanks for being here with us. Carrion: Thanks for having me. NEW: Our first question is what are your thoughts on your opponent at Retaliation Richie Paradise? Carrion: Richie Paradise thinks of himself as a top shelf talent. Every match I watch him compete in, he struts around like he's got it all. Next week, he may think the grass is greener on the other side, but it's not. That's simply because I'M on the other side. It's time Paradise has a nightmare and I will be honored to give him one. NEW: There is a noticeable difference in wrestling styles between you two. Will it be difficult to adapt to his style as you prepare for the match? Carrion: He has his style, I have my style; two very different styles. He may be the bigger man, but I'm faster, more agile. It won't be long into the match before I wind him down and finish him. NEW: With the history of Paradise trying to remove the masks of his opponent like when he tried removing the mask of Blanco Loco during their Florida State Championship match, are you concerned that he might try the same with you in your match?? Carrion: There's no doubt in my mind that he will try to take my mask off. He did not succeed while trying to unmask Blanco Loco. Blanco is a friend of mine and the other half of Lucha Chaos. I am a lucha libre wrestler. Playing with MY mask is the equivalent of playing with fire. To sum it down, it would be wise of him to not do this. NEW: Speaking of the Florida State Championship and your friend Blanco Loco, if Loco wins his unification match, would you want to go after the championship?? Carrion: Me? A championship? Of course I would be interested in a title match. Any title for that matter. If it just so happens to be a match against Blanco, then let it be. We will tear the house down with no hard feelings. NEW: Is there anything else you would like to say? To your fans or anyone else reading this?? Carrion: Expect the best from me every time I'm in the ring. That, not only, goes toward the fans but to everyone, including the entire roster. Richie Paradise... you have been warned. NEW: Confidence coming from what seems to be an eager but ready Carrion going into Retaliation. Thank you for joining us today and good luck against Richie Paradise next week! NEW: Check in soon for more exclusive interviews only on the NEW website. Until next time, hope to see you all June 17th for NEW Retaliation! This just in from the Sin City Super Star !!!!! NEW: NEW fans, welcome to the very first interview exclusively for the NEW website! Our first guest will be none other than Dravin Frost.Thank you for your time. Frost: Glad to be here. NEW: I want to begin to ask how you are after the whole horrific incident involving your fiancé this past Tuesday at Deception. Frost: I'm feeling anger and pain. Brittany should have never been brought into the situation with Deakon and myself. My pride was damaged because of him like a Roman gladiator losing his wife to a power hunger king. NEW: I understand completely. I was shocked myself as was everyone else in attendance. What is her status today? Frost: She is feeling better. Still a little shook up. NEW: Glad to hear she’s getting better. All of us wish her the best in her recovery. NEW: Switching subjects, you were named the number one contender this past week for the NEW Heavyweight Championship and the dominating Michael Kai Rayne. With everything going on with Brittany, what was your reaction when you heard the news?? Frost: I was excited but still angry with my current situation. NEW: Will you be mentally ready for the championship match at Retaliation June 17th?? Frost: I will be ready June 17th mentally and physically to the fullest. I just hope Michael Kai Rayne is ready to go to war with me. NEW: I know you are busy so I want to conclude this interview to see if you have any words to your fans that are reading this??? Frost: To my fans, thank you for all the hope and best wishes for Brittany. We will pull through this mayhem that has spun into a tornado. We will defeat all that stands in our way. Welcome to the New Age. NEW: We will be watching for sure and hoping for the best. Thank you again for your time. NEW: Deakon Star was asked for comment on this situation and he has declined for any interviews at this time. NEW fans, check back soon for more updates exclusively on the New Era Wrestling website. Thanks for reading! Match Added to June 17th Card!!!! Current NEW Tag Team Champion DB Harrison will face a man on a warpath Deakon Starr on June 17th! What role will Dravin Frost have after Deakon savagely attacked his fiance Brittany at lost months event? Be there to find out. Main Event for NEW Retaliation 2014! 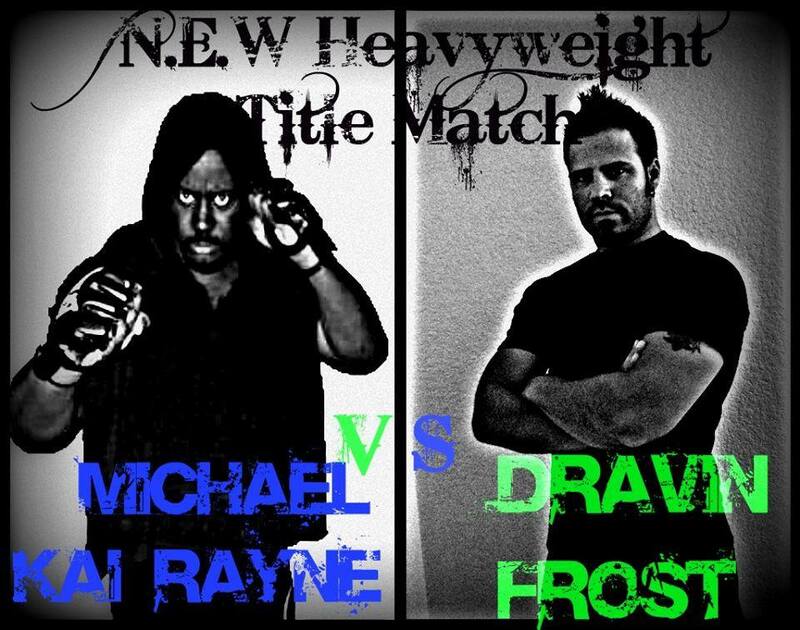 NEW Heavyweight Champion Michael Kai Rayne defends his championship against Dravin Frost! NEW Fans, which one do you think will walk away as the champion?? ?